When it was first discovered, astronomers thought this object was a comet and gave it the name C/2017 U1, but further observations revealed the fast-moving object did not have a tail of dust and gas as comets do. Instead, its image was seen as slightly extended due to its rapid motion across the sky. Within hours of the discovery being announced in the early morning of Oct. 25, the world's astronomers began to train their facilities on this unusual object. I'm an astronomer with the National Research Council of Canada, a leader of the Outer Solar System Origins Survey (OSSOS) and member of the Colours for OSSOS (ColOSSOS) project that is measuring the surface colours of Kuiper belt objects discovered in OSSOS. The ColOSSOS team immediately began observing this unusual visitor. The initial discovery announcement includes information from 10 observatories, each with its own team of astronomers. These observatories would have been privately alerted to the existence of this unusual detection and asked to provide confirming observations. This is a common practice to avoid a false announcement of an object's discovery when the orbit is significantly different than expectations. The International Astronomical Union designated the the object A/2017 U1. It's not the most romantic name conceivable but fascinating nonetheless. A/2017 U1 is probably of interstellar origin. This NASA Jet Propulsion Laboratory/Caltech diagram shows its path of travel from above the plane of our solar system, around the sun and past earth at 44 kilometres per second. It was closest to the sun on Sept. 9. The name A/2017 U1 is a code describing the object. 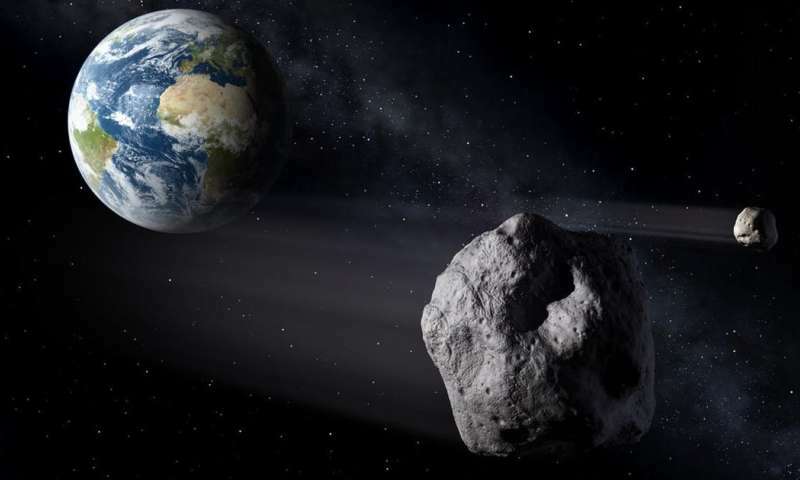 A for asteroid, followed by the year, bi-weekly period U (astronomers break the year into 26 two-week periods) and the number 1 to indicate this is the first object in this class in 2017. In reality, however, this is the first-ever known interstellar asteroid that humans have directly observed. From early in the process of the formation of planetary systems there is a rather large surplus of material—debris—that remains, which is not taken up into major planets. In our solar system, the asteroid belt is the nearest accessible remnant of such debris. The asteroid that killed the dinosaurs likely came from this belt of material. But the asteroid belt is a tiny fraction of the debris that a typical planetary system produces. Looking out at nearby stars that appear to be forming planetary systems, such as Epislon Eridani, we can see rings of billions of particles of debris. These rings of dusty debris are themselves only remnants of the initial material. Why so much debris? Once planets form, chaos takes over. Giant planets push and pull on each other with their massive gravity, scattering each other about and ejecting billions of smaller objects—some as large as thousands of kilometres across—into the depths of space. In our solar system, some of the material forms a halo of objects orbiting the sun at distances of 10,000 to 100,000 astronomical units (the Oort Cloud). An astronomical unit is the average distance between the sun and earth—about 149,597,870 kilometres—which is the standard unit of measure in planetary science. The physics of planet formation indicates that many billions of small objects—up to a few kilometres across—are formed for every object the size of Pluto. Some scientists argue that the large objects accrete from dust sizes and up, while others contend that large objects—100 kilometres across or more—form in single events and then grind down to smaller pieces. Regardless, these small objects can be held in very distant orbits or ejected from the influence of a star's gravity entirely. Once ejected, they become free-floating planetary mass objects, drifting through our galaxy—if you can call 80,000 km/h drifting. The existence of free floating planets that formed in orbit around a star and were then ejected has long been discussed and provided the first direct evidence for the existence of such planetary mass objects floating through space. Given models of planet formation, astronomers understood that many asteroid-sized objects should be freely floating also, but would they ever be detected? Most agreed that was unlikely, but not impossible. 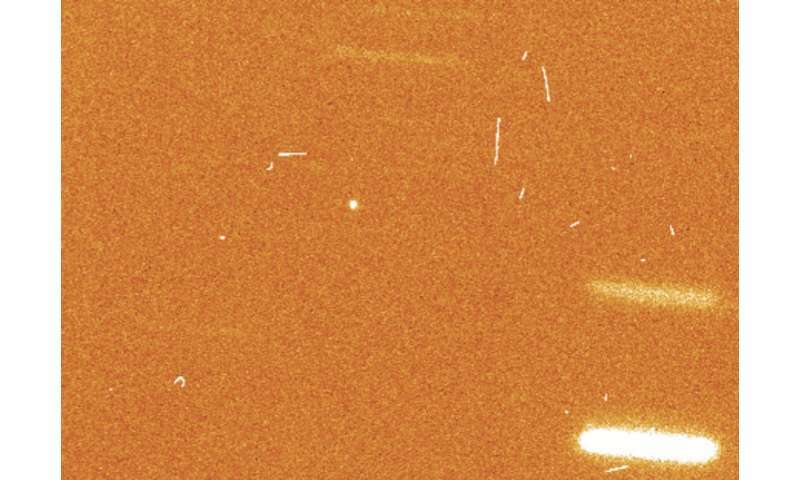 The Panoramic Survey Telescope and Rapid Response System (PanSTARRS) survey of the sky is designed to discover and track objects that might be on a collision course with the Earth. PanSTARRS surveys the entire sky every few nights and has discovered thousands of asteroids, near and far, in our solar system. One part of the mission is to alert supporting facilities, and the population of Earth, if an object with a high likelihood of Earth impact is detected. The massive data volumes produced by PanSTARRS are searched every morning and alerts to new and interesting discoveries are sent out to the world community. It is because of this machinery that astronomers were alerted to the existence of A/2017 U1. Dr. Joe Masiero of NASA's Jet Propulsion Laboratory had the 200-inch (5-metre) Hale telescope at Mount Palomar observatory in California trained on the object within hours of the public announcement after being alerted over Twitter. Two days later, the initial draft of an article describing his observations was online. These initial measurements are quite rough and the weather did not cooperate, but they show that the object is red in colour, much like members of the Kuiper belt—and unlike the much closer asteroid belt. These facts, along with the asteroid's trajectory, suggest it is of interstellar origin. More details of the properties of this visitor will be analyzed in the coming days. The ColOSSOS group obtained observations of the object with the Gemini eight-metre telescope in Hawaii a few days ago. Details of those observations, along with those from other groups, will soon be published on arxiv.org. One thing we are left to contemplate is the home from which this object made its journey to our region of space. 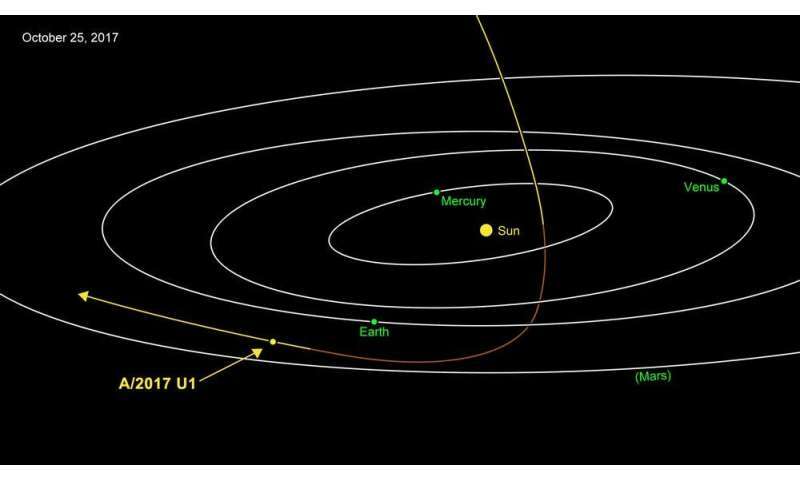 The trajectory excludes the possibility that this object is from our solar system. This is a visitor from another star—a natural interstellar spaceship. Eric Mamajek, deputy program schief scientist at NASA's Exoplanet Exploration Program, reports that A/2017 U1's motion velocity relative to the galactic centre makes stars in the group with Epsilon Eridani a plausible origin. If e-Eri was its home, then the object has come from just 10.5 light-years away, a journey of about 120,000 thousand years given its current speed—a mere blink in time. A/2017 U1 is a visitor from another world. The question that remains: As with Arthur C. Clarke's visitors, do they come in threes?